Can Old Belvedere seal a superb season with another title? Champions Old Belvedere beat UL Bohs in the semi-finals. THE FINAL OF the Women’s AIL Division 1A takes place under the Donnybrook lights as defending champions Old Belvedere face Blackrock. Old Belvedere have been imperious, the only blot on their unbeaten league run was a draw to Galwegians. They beat UL Bohemian 29-0 in last week’s semi-final. 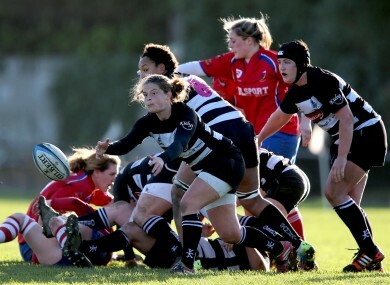 Blackrock have also had a strong season with New Zealand born Irish international Tania Rosser, who can play at both out-half and scrum-half, in flying form. The Stradbrook side’s only losses came away to today’s opposition and Galwegians, who they then beat 17-7 in the last four to set up today’s final. The last time the two sides met was in the fourth round of the competition at Anglesea Road. The first half was a cagey affair with the only score coming from the boot of Old Belvedere out-half Nora Stapleton. However, in the second half Blackrock crumbled as Old Belvedere scored four tries to win 39-0. Blackrock will be keen to atone for their poorest 40 minutes of the season. Their lethal backline, as well as Rosser, includes Ireland international Vikki McGinn at fullback, Ladies Gaelic Football Allstar Claire Egan on the wing and the impressive goal-kicking centre Jeamie Deacon. Old Belvedere’s class act boasts serious forward power such as prop Ailis Egan and explosive ball-carrying second row Emma Dunne as well as electric backs such as wing Janice Daly. The Division 2 final between Carlow and Cooke kicks off on the Donnybrook back pitch at 1pm. Who was Ireland’s greatest sportswoman in 2014? Email “Old Belvedere v Blackrock: Everything you need to know about today's AIL Division 1A final”. Feedback on “Old Belvedere v Blackrock: Everything you need to know about today's AIL Division 1A final”.